In Direct Store Delivery, timing and accurate asset tracking is crucial to efficient operations. Being able to dispatch and track deliveries, gather real-time store inventory data from various locations and re-route deliveries in a matter of minutes is essential. Winmate's new M101B rugged tablet offers a powerful, enterprise-ready solution in an innovative form factor. 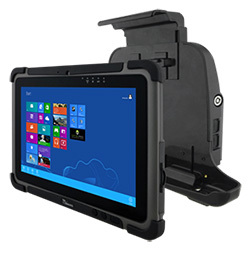 Winmate's quad-core powered rugged tablet can be securely mounted inside a vehicle with its dedicated vehicle dock, providing delivery route navigation and optimized fleet control. Upon arrival at the delivery location, our rugged tablet that's built to withstand shock, dust, water and 4-foot drops, can be quickly dismounted from the vehicle's dock to assist in delivery confirmation, load adjustments, invoicing, reports, and much more.